Real Estate Investment for Excel is an easy to use, inexpensive way to analyze income property before investment. This Excel based solution is specifically designed for real estate investors, brokers, agents, appraisers and consultants. Analysis: commercial property, apartment buildings, single-family residential properties, vacation property rentals, multiplex buildings, etc. Calculation of the optimal offer price. Forecasting of cash flow and ROI for each year. Forecasting of how much rent to charge to make a profit. Time required to see a return on their investment. Easy to learn and use - simply enter the values and calculations are made automatically. Unlimited units - analyze one unit or multiple properties with multiple units each. The application grows with the real estate investment portfolio. Loan amortization flexibility - the ability to enter multiple loans and mortgages (e.g. second mortgage, line of credit, etc.) plus fixed and interest-only rates. Concise, top-quality reports - influence the opinion of a buyer, seller, partner or lender. Seamless printing of forms and reports. 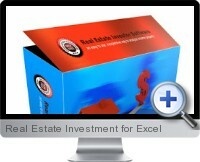 Real Estate Investment for Excel is compatible with any Windows, Mac or Linux running Excel or equivalent. Alternative versions are available for Canada and the UK.